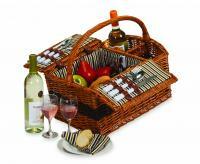 Join the picnicking elite with this handsome willow basket designed in the traditional English style. Beautifully fashioned porcelain plates are nestled into the plush blue corduroy interior and everything you need for the perfect picnic is stocked inside: corkscrew, wine stopper, utensils, cutting board, cheese knife, blanket and more. The Canterbury is the ultimate in the picnic experience offering a full service for two. This traditional English basket has full willow construction and plush corduroy interior allowing for a luxurious picnic experience. The Canterbury is a wonderful centerpiece for any picnic! Just add food and enjoy! The cups have their own straps, and the thermos is strapped to a basket shelf on the opposite side. The straps are genuine leather. Very nice product. Very pleased. I purchased the picnic basket as an engagement gift for my niece. I was very impressed with the look and contents of the basket. 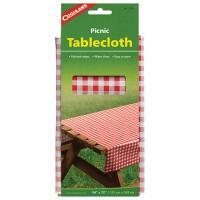 It included everything you would need on a picnic, including cloth napkins. I am so glad I found your website. My niece loved it and couldn't wait to have a picnic with her fiancÃ©e. We love our picnic basket. Too bad it is so hot, can't wait to get outside and use it. This picnic basket is amazing. It was worth the extra few euro. The pictures do not do it justice. It is much larger then I perceived and the basket, material and accessories are of great quality. The recipient of this basket was very impressed. I sent this to Canada and it was there within a week instead of the lead time I was getting of 3 weeks. Picnic World was the most efficient company that dealt with me (I tried to order from 4 other companies) and I had immediate responses to any queries I had. There were no hitches. 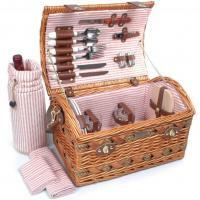 This picnic basket has high quality items and everything one needs for a picnic. Also, I think it is a great value too. I was very pleased with the picnic basket. When it came, one of the wine glasses was broken. After a phone call, I promptly received two more in the mail. It was purchased for a wedding gift, so I haven't used it, but it looks fantastic! I LOVE LOVE LOVE this basket! It seems to make all of my picnic goodies taste even better. I ordered the service for four basket for my daughter's wedding gift! They were headed to Napa for their honeymoon. After it arrived,I realized how large it was and we switched to the service for 2, which is actually what they will need 99% of the time. They are thrilled with this basket. It has absolutely everything you could possibly want or need. The quality of the table service is excellent! The flatware is top quality. I will definitely order from your company again. This was purchased for a wedding couple. It has everything you would need for a super picnic! It is very nice construction. In addition, I have monogrammed the blanket and etched the wine glasses with initials and am very pleased with my purchase!! This incredible traditional willow and leather picnic basket was an Anniversary gift for two very dear friends and I was quite jealous that they got to keep it, as I would have LOVED to have it! The quality of the basket and especially the beautiful serving pieces inside, including porcelain luncheon ware, stainless utensils, real glass wine stems and all the necessary 'picnic' provisions are first rate. Our friends were overwhelmed with their beautiful basket and we included a lovely bottle of wine and slipped it inside the corduroy wine pouch that came with the basket as a special touch! I would DEFINITELY order from this site again. Excellent quality, and value. First class picnic basket. I bought the Canterbury Willow basket as an engagement gift for my daughter. She was so delighted with it - especially the quality of the serving pieces. She has used it several times already and has had many friends ask about it. 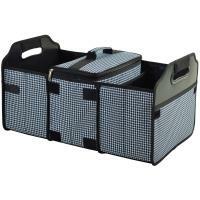 I highly recommend these picnic baskets - you won't be disappointed. The basket has everything I could ask for, it's just a little difficult to close (perhaps the leather straps will be easier to work with after a few more uses) and a bit akward to carry. So I just let my husband carry it! Other than that, I love it! I purchased the picnic basket as a wedding gift for a friend. She and her husband were thrilled with the quality and the design. I will be purchasing one for myself too. •2 Wine Glasses: 8 oz. •2 Cotton Napkins: 14" x 14"